This week we are pleased to feature picture book author Michelle Meadows, illustrated by Bill Mayer (Orchard Books). 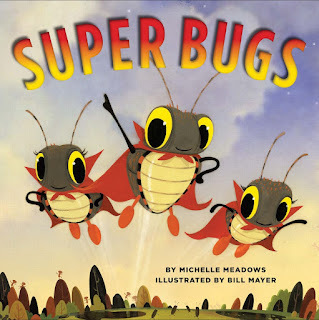 Be sure to enter into her giveaway of her newest book, SUPER BUGS. I have always been a writer. As a young child, I was drawn to poetry. And in college (Syracuse University) I studied magazine journalism and literature. I started writing for children when I had my son. I took him to the library all the time and loved reading with him in my lap. There is nothing like that personal connection between a parent and child when reading a book together. I wrote my first picture book, THE WAY THE STORM STOPS, after rocking him to sleep during a thunderstorm when he was about 2. I am grateful to Christy Ottaviano, the editor at Henry Holt who pulled that manuscript out of the slush pile. Congrats on your recent book, SUPER BUGS. What inspired it and how do you choose what to write about? Thank you! Reading SUPER BUGS at school visits has been fun. I have had various encounters with bugs, and it opened my eyes to their vulnerability. They are such tiny creatures in a big world. They get stepped on, slurped up, swatted, and squashed. So I set out to create a book where superhero insects save the day and protect these little creatures from harm. I tend to write about things that I care about – topics I have a passion for and that I feel strongly about. 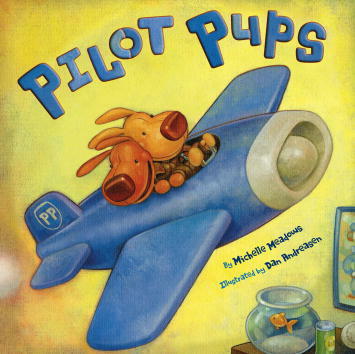 You write fun, rhyming picture books. Does rhyming come naturally to you, or did you have to learn and work at it? I love rhyme! It does come naturally to me, and I am so grateful for that. I still work at it in the sense of working on the craft of poetry. I read a lot of poems and rhyming stories. What advice would you give someone who wants to write a rhyming story? I advise people to rhyme only if they love to do it – if it’s truly enjoyable for them. That’s why I do it. I think that if you feel like rhyming is a painful struggle or if you don’t really like to read rhyme, then don’t do that to yourself. I think when you force it, it shows in the writing. I always say: Write what you love to read! If you love rhyme, then go for it. Read a lot and keep at it. You have started a blog featuring short and snappy books. Why do these books appeal to you? Speaking of writing what you love to read, I started the Short & Snappy Book Blog because my favorite books are short and snappy. Those are the books I love to read and the books I strive to write. I have a very short attention span, similar to little kids! I really admire books that can pack a lot of punch in a concise, lyrical way that makes information accessible for very young readers. What projects are you working on now? Any new books coming out? My latest project is called THIS IS THE DANCER, which is a tribute to Janet Collins, the first black prima ballerina with the Metropolitan Opera House in 1951. 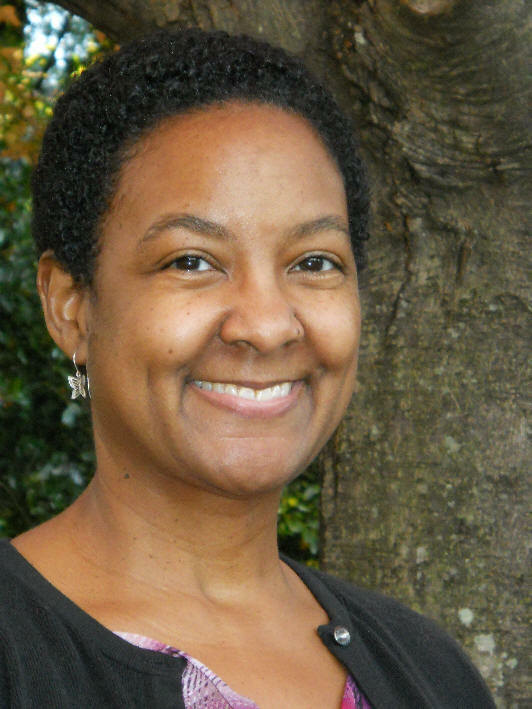 This picture book will be illustrated by Ebony Glenn, who creates beautiful art. THIS IS THE DANCER is slated to be published by Henry Holt in 2018. Most people don’t know that I take a ballet class for fun and fitness. It combines my love of music and dance. Visit my web site http://www.michellemeadows.com. The site links to my Facebook page, Pinterest page, and Goodreads too. 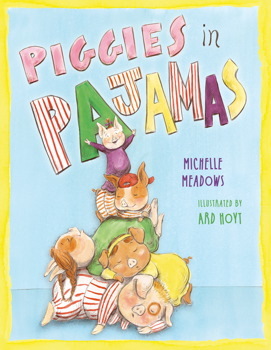 Michelle Meadows is the author of eight rhyming picture books: THE WAY THE STORM STOPS, PILOT PUPS, TRAFFIC PUPS, HIBERNATION STATION, ITSY BITSY BABY MOUSE, PIGGIES IN PAJAMAS, PIGGIES IN THE KITCHEN, and SUPER BUGS. HIBERNATION STATION was a nominee for two awards: the South Carolina Picture Book Award and the New Hampshire Ladybug Picture Book Award. The Bank Street College of Education's Children's Book Committee named HIBERNATION STATION a Children's Book of the Year in the Under Five category. Michelle is represented by agent Rosemary Stimola. Short and snappy is how I like my picture books, too! Michelle's books sound terrific and I'm going to check them out for sure. Thanks for the giveaway! Thank you, Teresa! Long live short & snappy! Thanks for the writing advice. I recently took a rhyming picture book class and understand so much better what to do and what not to do. Rhyming is very difficult to get it perfect with the meter. These books are adorable and fun! Thanks, Danielle! Great that you took a class. I love kidlit classes and believe they are quite helpful. 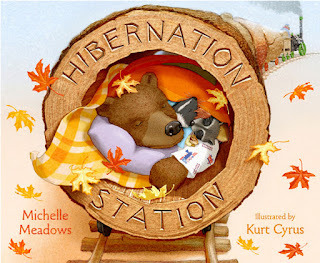 Oh, I cannot wait to read this book - Hibernation Station has long been a favorite in my home and I could see this one being a big hit too! Thanks, Jessica! Glad your home has enjoyed Hibernation Station. I have always wanted to hibernate when it gets cold. Super Bugs looks super fun! We love Hibernation Station at our house, too! Thanks,Lauren! So great that you all are enjoying Hibernation Station! What fun books. Thanks for sharing! Can't wait to read your new book! Congratulations! Thanks Kristi! 2018 seems so far away but I think it will be worth the wait. The illustrator is wonderful. Super Bugs! What a great idea :) Requesting from the library now! This looks like such a cool book! Thanks so much, Avigayil! Happy Holidays! Thank you, Jena! Happy New Year!